Liposuction is a safe, effective outpatient procedure to reduce isolated pockets of fat that do not respond to regular exercise and a healthful diet. Whether you want to get rid of fat from under your chin, on your hips, tummy, or thighs, this treatment performed by Dr. Rhoda Narins can help New York City and Westchester residents achieve a slimmer, firmer look. Men and women across the country seek out Dr. Rhoda Narins at her New York City practice for liposuction specifically because Dr. Narins is a pioneer in the treatment. Dr. Rhoda Narins is a liposuction pioneer. Her mission is to help patients look and feel great. Performed more than 8,000 liposuction surgeries. Safe, effective, performed under local anesthesia. Latest technology including laser liposuction. Dr. Narins has made it her mission is to help her patients look great and feel great, and her specialized experience and training in liposuction surgery is one way she achieves this goal. She trained in Paris with the doctors who originally developed the procedure and was one of the pioneers that brought the procedure to the United States. From her New York City / White Plains practice she has now performed more than 8,000 liposuction surgeries herself. She is a dedicated, compassionate surgeon whose eye for detail and skilled hands provide patients with high-quality results. She also remains on the leading edge by offering CoolSculpting nonsurgical body contouring for her patients. Liposuction is performed using local anesthesia, allowing you to remain awake and able to speak during the entire procedure. The local anesthetic consists of a very weak solution of lidocaine and epinephrine treated with sodium bicarbonate, which make the process virtually painless. When you check in the morning of your surgery, the staff will show you to a comfortable, private room. Dr. Narins will again discuss the procedure with you, perform an examination, and answer any additional questions. She will mark all areas to be treated and all possible incision sites. You may be given oral medication as well as intramuscular sedation to make you comfortable and relaxed. During surgery, Dr. Narins makes a series of small incisions through which she inserts a small tube called a "cannula" that breaks up and removes excess fat. She moves the cannula back and forth in the tissue beneath the skin, removing fat from each local area. You will probably be pleased, like most patients, as you watch fat being extracted through the clear tubing on its way out of your body! To produce an even, smooth result, Dr. Narins usually uses multiple cannulas of different shapes and sizes. 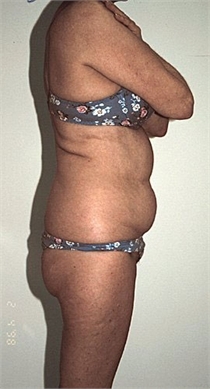 She may use ancillary liposuction techniques as well, including power and laser. Substances to avoid: Avoid aspirin, ibuprofin (Motrin, Advil), aspirin-containing compounds, St. John's Wort, Vitamin E, and anti-inflammatory drugs for 2 weeks prior to surgery. These drugs decrease clotting and can cause excess bleeding during or after the procedure. Our staff will give you a full list of substances to avoid prior to surgery. Precautionary medication: You will be given a prescription for antibiotics that you should fill before the day of your surgery. Make sure to begin taking the antibiotics the day before the surgery as directed. Hygiene: Wash the areas to be treated with an antibacterial cleanser daily for 1 week prior to surgery. Shower and wash your hair the day before, or the morning of, the surgery as you may not be able to do so for a few days postoperatively. Clothing: The day of surgery wear loose, comfortable clothing that is easy to take off and put on, such as a shirt with buttons and elastic waist pants. Assistance: Arrange to have a friend or relative to drive you home after your cosmetic surgery and assist you for at least the first day. When the procedure is complete, you will immediately notice the improvement. You will need to wear a light support garment for about 1 to 3 weeks, and you might have mild bruising. Most patients are ready to return to non-jarring, non-contact exercise, including work, with a day or two. You should be able to resume more strenuous exercise in 3 to 4 weeks, depending on the extent of the procedure. Dr. Narins sees most patients within 1 to 3 days of their procedures for a follow up appointment, and then once more after about a week. Our office can make other arrangements for our out-of-state and out-of-country patients. Dr. Narins' patients are very happy with their new shape. Eating right and exercising regularly will help you maintain your more youthful and attractive shape.